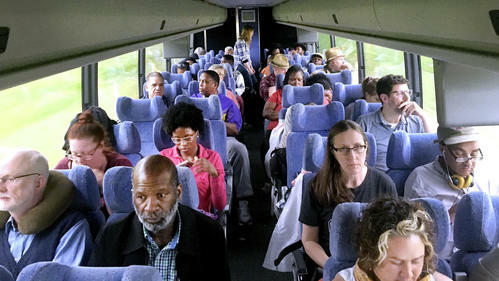 Follow along as two MPR News journalists take a bus ride from Duluth, Minn. where three black men were lynched in 1920 to Montgomery, Ala. for the opening of a memorial to honor the thousands of African-American men, women and children that were lynched in America. The National Memorial for Peace and Justice, opening Thursday, stands high on a hillside overlooking downtown Montgomery, Ala. Beyond the buildings you can see the winding Alabama River and hear the distant whistle of a train — the nexus that made the city a hub for the domestic slave trade. 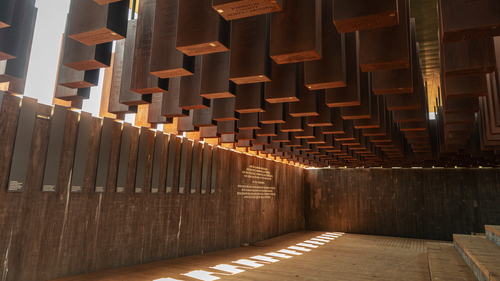 "You see the agony and the anguish and the suffering in these figures," says Bryan Stevenson, founder and director of the Equal Justice Initiative, the non-profit legal advocacy group that created the memorial.